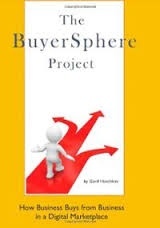 The BuyerSphere Project is a fascinating look at how businesses buy from other businesses in the digital marketplace. The insights covered by author Gord Hotchkiss are based on an extensive research project that explored the true behavior of the people actually involved in purchase decisions at thousands of companies. Many of the traditional beliefs long held in the B2B marketplace were overturned by the research, including: The validity of the buying funnel model, the notion of rationality in a business purchase and the separation of online marketing from the core best practices of traditional sales and marketing. Called an “epiphany smorgasbord for B2B marketers” by the VP of Marketing for Business.com, The BuyerSphere Project delves deep into the reality of what’s happening on the buying side in organizations, giving marketers a new perspective of how to use their digital assets.